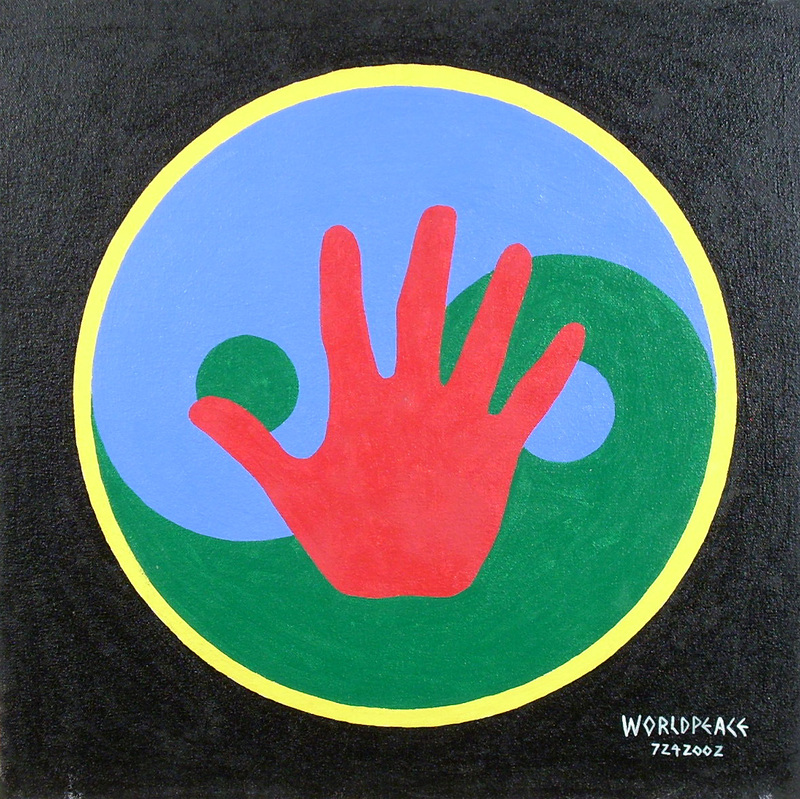 The WorldPeace Insignia is a round symbol, with a hand in the middle (symbolizing man - the number 5), which represents a human being. Red is the color of human blood. Where two fingers stand for peace, four fingers and a thumb mean WorldPeace. When this connection is made within the world community, people will think about WorldPeace every time they wave hello or goodbye. Behind the hand is a yin-yang symbol. This signifies the constant change in all dimensions and all aspects of this reality, where things constantly manifest and constantly disintegrate, causing never-ending disharmony. There will never be perfect peace on earth because things will never quit changing. The yin-yang symbol is in green and blue, which represents the planet (blue sky - green earth). The yin-yang symbol represents the duality of all things as they constantly encroach upon each other. The blue is constantly invading the green. Within the blue is contained green and within the green is contained blue. Within the darkest night, there is light and within the brightest day there is darkness. Around the earth colored yin-yang is a yellow band, which indicates the physical sun behind the blue and green earth. The sun is the light of the physical world and also represents the spiritual light of all the founders of all the major world religions. The black band around the sun represents both the physical universe (which is actually indigo or beige depending on which scientist you listen to) and the spiritual universe from which all things manifest and back into which all things disintegrate. The overall symbol is round and represents the “no beginning - no ending” oneness (unity) of all things. Therefore, this insignia represents not only peace during this Iraqi crisis, but also an ongoing statement of peace and WorldPeace for all times. With or without war, we must be constantly mindful that all things change. The only way we can find peace is to acknowledge this never-ending change. We must remain vigilant in our attempt to minimize the disharmony caused by change.